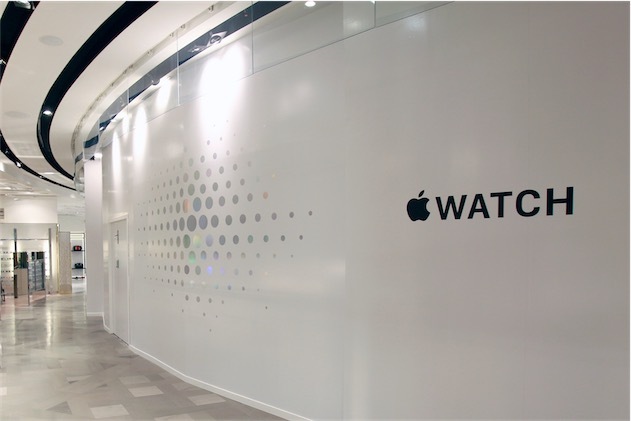 Apple today officially announced April 10 grand openings for its three dedicated Apple Watch shops located in high-end department stores in London, Paris, and Tokyo. As previously outlined, the store-within-a-store locations are at Selfridges in London, Galeries Lafayette in Paris, and Isetan in Tokyo. The new locations appear set to handle only Apple Watch viewing and sales, with customers being directed to other Apple retail stores for their support needs. The Selfridges Apple Watch shop will be located near the entrance to the iconic Wonder Room, a massive shopping hall that houses a wide selection of luxury jewelry and watch brands alongside a concept store and mezzanine wine bar. Apple has reportedly been drawing employees from other retail stores in London to staff the new shop. The Galeries Lafayette shop will take over four balcony sections overlooking the main rotunda of the department store. Apple will begin in-store previews and pre-orders for the Apple Watch on April 10, with launches in the first wave of countries coming two weeks later. The high-end gold Apple Watch Edition models will only be available at select Apple retail stores, and the dedicated Apple Watch shops at these luxury department stores will almost certainly also be featuring the gold watches, which are priced from $10,000 to $17,000. Nothing in LA, NYC, or Dubai? Surprising. First completely new product family without you know who. iPod had no reason to exist - There were Walkmans and CD players. iTunes had no read to exist - there was the radio and heck, even Napster. The iPhone had no reason to exist - cell phones and even "smart" phoned aready existed. The iPad had no reason to exist - laptops were already huge and other tablets had already failed. Notice a trend here...? None of these products had a "reason" to exist other than convenience and assurance of a quality product. Besides, if I had to guess, Apple has bigger plans for the Apple Watch than just a side kick for the iPhone. My thought is that they can/will eventually sell it as its own standalone product that doesn't need an iPhone wirelessly attached and can event text, call, etc. all on its own. Well I guess that answers the question of "How are they going to store/sell these in existing Apple Stores?" They aren't. I assume eventually at least some of the larger Apple Stores will, but probably need a lot of modification first. All Apple stores are getting the watch. According to 9to5Mac the night of 8th and/or 9th will be used to get stores ready. These are just dedicated Watch store-within-a-store. That black background with gray/white characters look like a Windows Phone advertising. Complicated interface - don't think so.. the apps are looking very simple. No real reason to exist - thanks for clarifying that you have absolutely no idea what a smart watch is for. As someone stated before, maybe there are different categories of people that do feel the buzz. I don't know anyone that's going to buy one however (and I know a lot of Apple minded people that did go out and buy the ipod, iphone or ipad). I really wonder how it will sell, but can't begin to guess. Apple also announces iCharging stations are being placed every 10 feet so that people who are stupid enough to buy a watch that needs charging whilst you use it can actually use it. I guess you missed the part where they said 18 hour battery life. Unless you get less than 6 hours of sleep, it shouldn't be a problem. It's very strange how angry people are getting over something they're not forced to buy. If you don't want it, don't buy it.